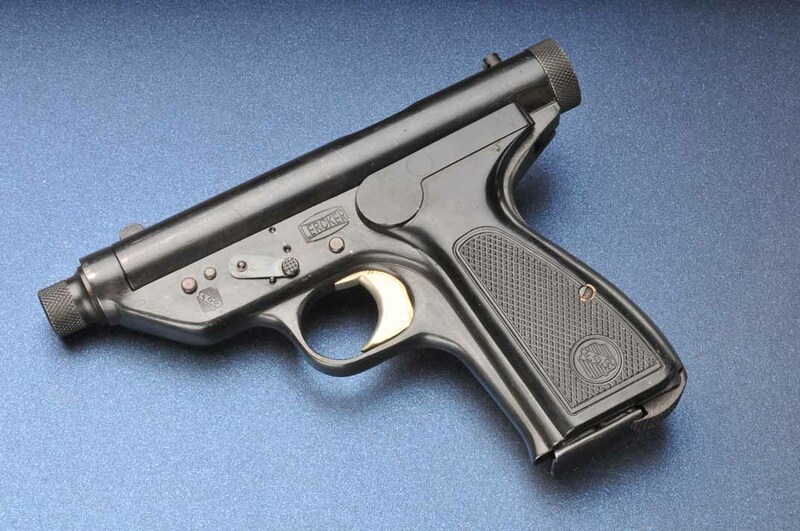 We don’t have very much information on today’s forgotten weapon, which is an Italian machine pistol designed by a gunsmith named Lercker. He worked for Beretta, but also had his own shop, where he designed this pistol. Of course, the utility of a .25ACP machine pistol with a 20-round magazine and 1200rpm rate of fire is also pretty questionable. The Lercker doesn’t even make a nod at utility with a shoulder stock. Thanks, Roberto! You can download a zip file of all of these photos here. That is some very high quality sheet metal work. That to me is equally unusual. IIRC there was a Mauser submachine-gun (in 9 mm of course) that looked very similar to this weapon. piece should be, having similar stopping effect of a .380″ cartridge with an advantage of larger impact area within the same duration. The number made is also subject to some dispute, between 150 and 500 in total before they were all seized by the Italian police. Wait, what? How/why did that happen? Tell us a story, Daddy! I’ll second that Joel’s request. The Northern Italians of this era had a reputation for quality, short run sheet metal work. Not far from Valle Triomphe, where this pistol was made, Chrysler had 50 turbine cars made for less than $ 100,000 each – in today’s USD! Beretta and FIAT have consolidated most of the small industrial shops in this area over the last two decades. I wonder whether the Northern Italians could still do this kind of work today. It would be a shame to lose this kind of skilled workmanship…. John: Do you mean Val Trompia, in the Brescia region, or Gardone Val Trompia (the town)? All the Brescia area is renowed for quality metalwork since roman times. Thanks for the Chrysler story – I find it fascinating. I also wonder whether the kind of highly skilled workmanship so evident in the pictures of the weird Lercker machine-pistol is still around in Northern Italy. I once handled another fine example of Brescia’s guns manufacturers’ work finesse, the Benelli B76, and was highly impressed. It is a very nicely made and accurate pistol, but somewhat of an oddball when it was marketed, right in the midst of the large-capacity ‘wondernines’ fashion. In a sense, it is a forgotten modern weapon. There’s a .32ACP Benelli M78 (same as the M76, just in the smaller caliber) for sale in a shop near me, and I’ve come *this close* to buying it a couple times. They are extremely well made guns. Another interesting variation is the B80, in 7.65×21/.30 Luger. I guess these must be quite rare in the US. What about other Northern Italian, Mr. Emilio Ghisoni, and his Mateba revolvers and pistols – yes, pistols too, or am I the only one here old enough to remember the M95 semi-automatic pistol in 9 mm with barrel’s breech end tipping UP for unlocking? His first revolver was the MTB8, an 8-shot 357 in times when nobody else offered a 357 eightgun, with cylinder tucked low in frame, distinctively Broomhandle-flavored, in front of the trigger guard – and still firing from top chamber at that time. Then came the Unica 6 semi-automatic recoil-operated revolver, firing from bottom chamber – and recently the Chiappa Rhino being a ‘regular’ non-automatic revolver, also firing from bottom chamber. All of these display outstanding quality – and them all being stuff defying logics and reason, I think the craftmanship was the only reason why they ever operated. I don’t know what was the stuff Mr. Ghisoni smoked at that time, but I’d rather refrain from sharing it. No, you are definitely not the only one old enough. I remember the Mateba revolver very well. It was once offered in Germany by Holme, a gun dealer near Munich. But I must admit that the pistol unlocking by an upward movement totally escaped me. I’ve a copy of Ghisoni’s patent for a semi auto pistol (browning style rather than Fosberry style!) which had the breech end of the barrel tilt up for extraction and ejection, and then tilt down for feeding, but I didn’t realize that it had actually been produced. I re-discovered Ghisoni and his Mateba designs in around 2006, just about the time the poor fellow was taken ill and died. I was spending quite a lot of time in northern Italy back then, and would have loved to have met him, though I’m not sure my wife would have enjoyed interpreting. I saw a photo of Ghisoni, in the British magazine “Handgunner”, in the mid 80s. He looked to be in his 60s then. Supposedly he was a very good rapid fire competitor. it looks a lot like a prototype. From the proportions of the case, it looks like it’s chambered in 9*21, which was a simple get around of the Fascist era (and only recently ended) law banning possession of “military calibres” in Italy. lengthen the brass by 2mm and leave all other dimensions and the loading the same as 9mmP and lengthen the chamber to match. My Italian spelling is getting rusty. I worked north of VT in the 1980’s, but haven’t been back since 1990. Was referring to the entire region, which is integrated industrially. The Chrysler turbine cars were made in 1962 – 1963, about the time this neat little machine pistol was made. The Italians of this era were the master of Kirksite die stamping, the method probably used to make the Lercker. Kirksite is a low melting point alloy which is easy to cast and machine. Kirksite dies can make 50 – 200 steel stampings, but require great care in their usage. The Benelli handguns are favorites of mine. I have the B76 (9mm), B78 (7.65x21mm), B80 (9mm Ultra), B82 (7.65x17mm), M3S (.32 S&W L), M7S (7.65x21mm), and M9S (9mm). The last three are long barreled match versions which are quite accurate due to the fixed barrel design in all calibers. Buy them any time you find them for less than 500 USD. You won’t be disappointed. Thank you so much for the concise but very informative insight on the Chrysler turbine cars and the Kirksite die stamping method. So, I presume Chrysler went ahead with outsourcing in that particular case not to save on production costs, but because the Italians were very good at that, possibly the best in Europe, as you implied. Very interesting story, on which I knew nothing. The Benelli pistols are indeed great guns. I heard that some new old stock specimens (mostly B76 from what I have been told) can still be found, if one searches hard enough. At 1200 RPM the impulse from a .25 APC is not going to be much as long as you don’t dump the whole magazine. I vaguely remember reading about some double barreled machine pistols / SMGs chambered in .25, effectively siamese twin machine pistols, with the double barrel drilled from one piece of steel. The multiple impacts (20 rounds a second – assuming you could hit) delivered a payload roughly equivalent to 2 or 3 shots of OO Buck loads from a 12 guage, with less disturbance and from a much smaller, easier concealed and easier suppressed gun. There are suggestions that if a tight group can be achieved, the multiple small hits in sequence are more effective than a larger round at shredding body armour, although that assumes that the target will stand still long enough for it to happen. The little Mexican Trejo .22 LR machine pistols are another example of small calibre full auto sidearms. I would think that for full-auto weapons, .25 ACP would be better simply because it’s rimless (or rather, semi-rimmed) and centerfire, which would tend to make it more reliable. I just remembered a similar concept, though it was designed to work as a semiauto only. The resulting gun was unusual and interesting in a kind of bizarre way, as it also fires from an open bolt and lacks a hammer or striker… Maybe Ian can dig additional details to produce a small article on it: the oddity is the Argentinean Ballester-Molina HA, produced by Hafdasa and its subsequent clone ‘Zonda’ built by Armotor SA after Hafdasa folded in 1953 (Armotor SA was created by former employees from Hafdasa), both in .22 LR. The open bolt guns blog has pretty good coverage of the Argentine clones of the Gevarm open bolt .22 semi auto rifles csrbines, but I’d never heard of a pistol using that system. Many thanks for sharing. You are welcome! I have a more detailed article on the HA and Zonda pistols somewhere (it a xerox copy from an Argentinean magazine). If you’re interested, I can send dig it out. There’s much more to that little pistol than the gevarm I was likening it to, it has an extractor for a start. I don’t understand Spanish, but youtube suggested another vid with a slightly different version of the pistol, and some different views of it. The boy who made the video isn’t the safest, the most knowledgeable, or the most succinct… but the gun is cool. There was also a suggestion for a vid by Mark Serbu, showing an experimental full auto .22 he’s playing with. there was no trigger mechanism, he was just pulling the bolt back with his fingers and releasing it for the gun to empty its mag in around 1/3 of a second. fixed firing pin/ridge and no extractor. I dunno, if it wasn’t for the fact that automatic guns are illegal for most people to carry, I’d say this gun is a good idea for a defense weapon. Perhaps a .25ACP is a bit anemic, but it’s usually sufficient to stop a person who isn’t out of his mind, often just by threatening them with it. It’s certainly better than no gun. Having a more powerful caliber is great, but most of you probably know just how hard it is to shoot straight when the adrenaline is pumping, and you’re in a darkened area somewhere, and in danger. A more powerful cartridge is great, but only if you hit the guy. An open bolt .25ACP pistol firing at 1,200rpm will give you the ability to fire two half-second 10-round bursts at your target. I think that gives you a great chance of hitting the attacker, even in low-light situations, even when your heart is pounding and adrenaline is up. The recoil should be low enough and the rate of fire fast enough, that muzzle rise shouldn’t be a big issue, especially if you use two half-second bursts and don’t empty the whole magazine at once (although that’s an option if the attacker is a few yards away and headed at you with deadly intent). Some people rely on derringers with only two shots in them, and feel sufficiently protected. This gun gives you two 10-round blasts of bullets, almost as if you were carrying a double-barrel shotgun that fits in your pocket and has little recoil. And of course, although the accuracy and power of the gun is limited, it does give you the option of using as a semi-auto, in cases where spraying a burst of bullets isn’t wise. A .25ACP might not be any .45ACP, but it’s going to hurt the average person, and the average person is going to avoid being shot by one if possible. And of course, five .25ACP bullets to the torso could be very deadly, even if a single one is underwhelming. If you manage to get a solid 10-round burst in, every one hitting the torso, chances are the target won’t survive, or at least will be in intensive care for a long time. Anyway, in summary, I’d say it would serve as a little pocket-shotgun for the everyman. Not that what I say matters, since they don’t let the serfs have automatic weapons (too much of a threat to the powers that be, clearly).